Picture yourself back in the early '90s - specifically, 1993. Double denim is still acceptable, Jurassic Park is proving to be a boon for the manufacturers of hollow, gawping dinosaur toys, and endless, near-identical children's books on prehistoric animals line the still plentiful bookshops. What a wonderful time to be alive. 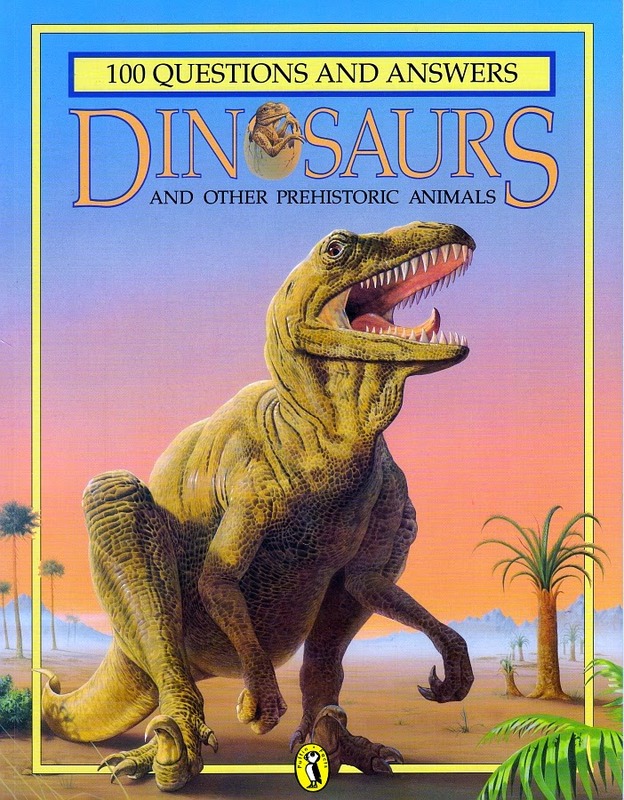 100 Questions and Answers: Dinosaurs and Other Prehistoric Animals is a very typical book of the age, which is to say that it's filled with shameless John Sibbick rip-offs. But hey, there's still some entertainment to be had along the way. Unless you're John Sibbick. This spring, Daniel Loxton published his third and final children's book in the Tales of Prehistoric Life series: Plesiosaur Peril, the story of the dangerous life of a young Cryptoclidus in the Jurassic. It was proceeded by Ankylosaur Attack (2011) and Pterosaur Trouble (2013). Today I'll cover all three. The TL;DR version: they're great. Daniel Loxton's name is probably recognizable to the portion of our readers who also follow skeptical media. He cowrote Abominable Science with Donald Prothero as well as writing and illustrating the children's book Evolution: How We And All Living Things Came to Be. Loxton is also well-known for his work editing the Junior Skeptic section of Skeptic Magazine. 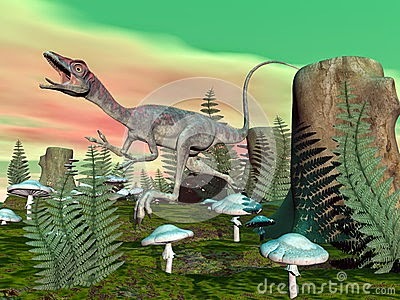 Illustrator Jim WW Smith, who has also worked for Junior Skeptic, provides work on the models for the Tales of Prehistoric Life series. Loxton provides the finishing textures and colors, as well as photographing environments. I especially appreciate Loxton's series for taking up the mantle of the Rourke titles we've covered so many times during the Vintage Dinosaur Art series. Like the Rourke collection, each Tales of Prehistoric Life book is a narrative story, detailing interactions between temporally and geographically appropriate animals. I love this approach. When grounded in modern paleontological understanding of the life and times of the animals involved, it's both engaging and educational. Like the Rourke titles of yesteryear, each book in this series also wraps up with a brief explanation of the scientific grounding of the story. The Cryptoclidus family swims through a teeming Jurassic sea. © Daniel Loxton. The animal interactions are firmly in the realm of plausibility. There are moments that seem a bit of a stretch, such as a veritable army of Saurornitholestes laying seige to the Quetzalcoatlus hero of Pterosaur Trouble. However, there's nothing more outlandish than Dinosaur Revolution's more slapstick moments. Since I'm on the record of admiring much of what that series did, you can predict my reaction here. When the Quetzalcoatus quad-launches to escape his attackers, one of them inadvertently hitches a ride before being flung onto the head shield of a Triceratops, and I couldn't help but crack a smile. 3D dinosaur art is too often only mentioned when picking out the worst offenders, so it's easy to forget that it is often done very well, and Loxton's work here is a prime example. For the most part, the animals are integrated into their photographic environments very smoothly, and interact with them believably - there is a sense of weight and heft to the animals as they walk on sand, browse vegetation, or fall into water. The experience is an immersive one, with illustrations filling entire spreads. The point of view is often right in the middle of the action. Loxton's attention to detail rewards free exploration of the environments and their inhabitants. Feathers float on the air in the midst of combat. Age and experience are obvious, as in an old ankylosaur with battle-damaged armor or a pycnofibre-covered pterosaur. 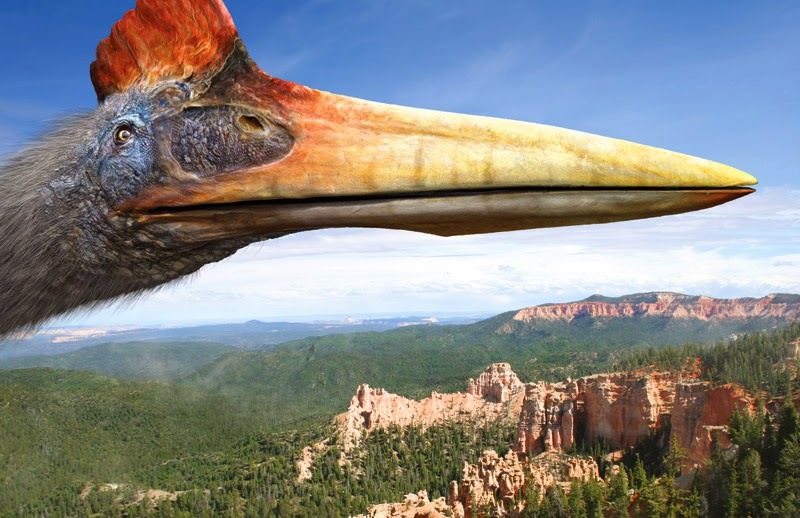 Quetzalcoatlus soars over the late Cretaceous world. © Daniel Loxton. 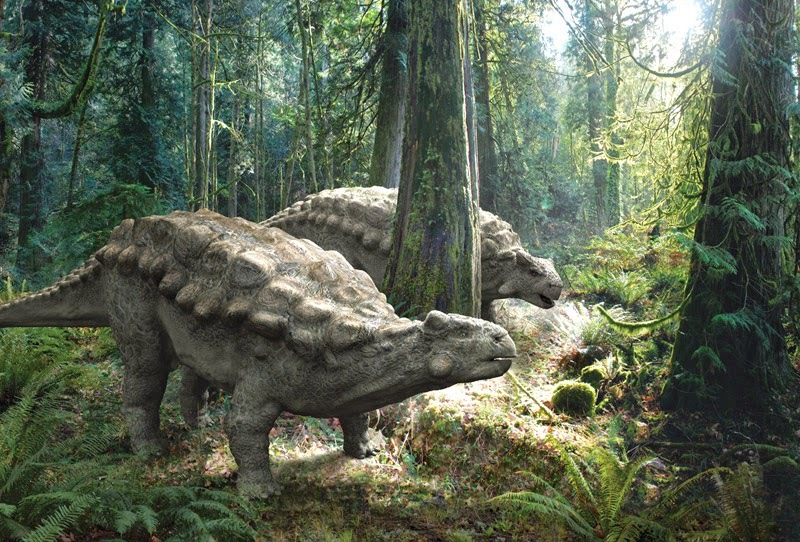 An Ankylosaurus couple browses in the forest. © Daniel Loxton. Coloration is handled conservatively. There are no Rey-style color schemes. Proto-birds and dromaeosaurs are given the most colorful integument. I particularly liked the ruddy tones of Saurornitholestes, reminiscent of the Brown Thrashers who inhabit a similar woodland habitat in my neck of the... er, woods. I also enjoyed touches like subtle sexually dimorphic coloring on the Triceratops, and a seaweedy-green on the Cryptoclidus family at the heart of the most recent book. The tyrannosaurs who appear in Ankylosaur Attack and Pterosaur Trouble could do with some plumage and a splash of color (as well as some more neck musculature, which to my eye looked a little skinny). On the other hand, it's refreshing for the tyrant king to step out of the spotlight. A Saurornitholestes pack smells something big and tasty on the wind. © Daniel Loxton. 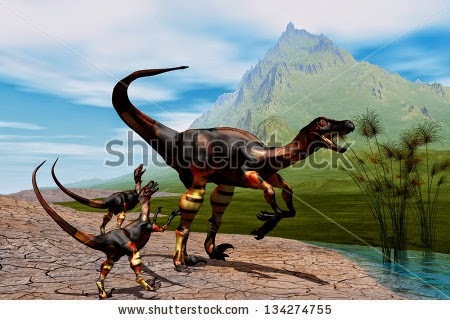 Loxton's choices in depicting behavior are the strongest aspect of the stories, as pains are taken to focus on details of Mesozoic life lent us by recent paleontological research. Quetzalcoatlus falls prey to small dromaeosaurs because of tooth marks found on actual fossils of the great azhdarchid. It bears repeating that the pterosaur is depicted performing a quad-launch, too (a touch which pleased Mark Witton greatly). 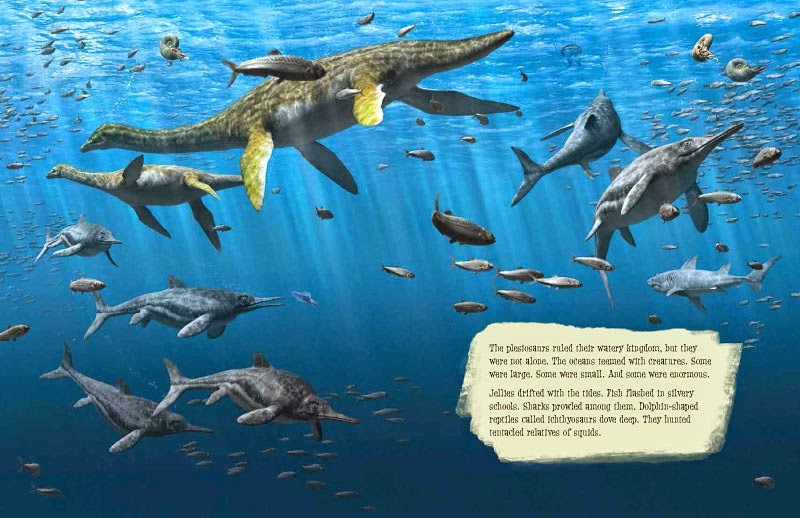 The family unit in Plesiosaur Peril is based on evidence that these marine reptiles were viviparous. It's a stretch to lump Loxton's book series in with the All Yesterdays Movement. But it is certainly complimentary in its dedication to anatomical fidelity and reasonable inference, while offering views of prehistoric life which reflects the way extant animals act rather than what Hollywood dinosaurs are asked to perform for the masses. There's no need to layer on excessive personification or spectacle after spectacle. Loxton's adherence to this is the main reason the books succeed. The Cryptoclidus family feeds on belemnites. © Daniel Loxton. My only major critique is that a more readable typeface for the body copy of the books could have been chosen, but that's a small quibble in the big scheme of things. This is as good as prehistoric fiction gets. The life restorations are exactly the kind that the new generation of paleontology fans should have access to: contemporary, not stuck in decades-old knowledge. All books in the series are available at major booksellers or via Skeptic. Around the web: Check out Loxton's post about Plesiosaur Peril at SkepticBlog. Darren Naish wrote a detailed post about the book at TetZoo - fitting since he served as technical consultant for the whole series. 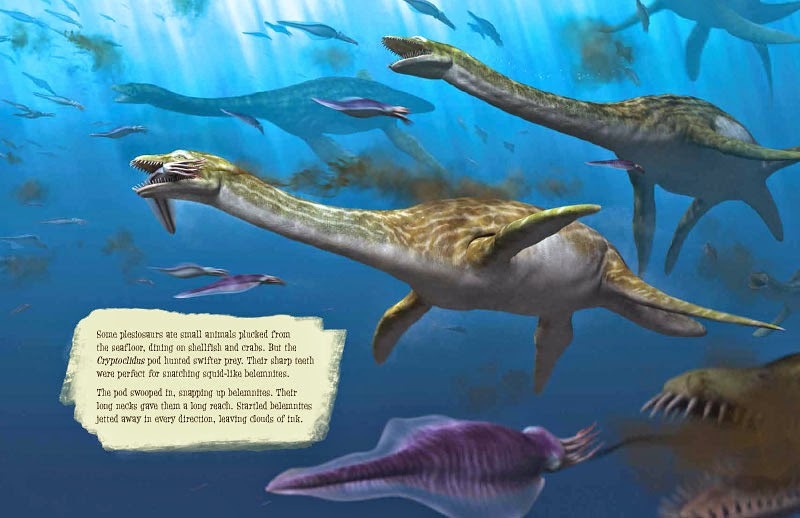 Adam Stuart Smith reviewed Plesiosaur Peril at Plesiosauria.com. Dispersal of Darwin's Michael Barton reviewed Plesiosaur Peril in March (and reviewed the other titles in the series previously). Ankylosaur Attack recieved positive reviews from Quill and Quire, Kirkus, and SkepticDad. If you have not read Witton, Naish, and Conway's State of the Palaeoart, make a point of doing so. The article is the culmination of a discussion that seems to have begun in earnest back in the spring of 2011, when the Dinosaur Mailing List played host to complaints from Gregory S. Paul about other artists copying his famous mid-stride skeletal pose. 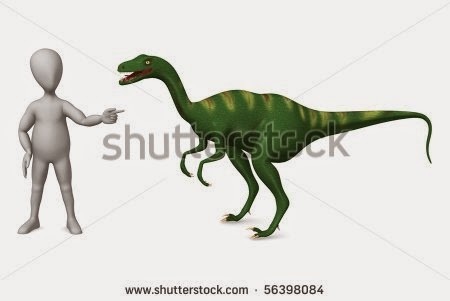 Though GSP kicked off a righteous ruckus with his assertion that he owned that pose, the argument was also a chance for people to air their opinions about why it's so difficult for artists to rely on paleoart to sustain, or even significantly contribute to, their career. I wrote about the brouhaha in two posts here, The Great Debate in Paleoart and Essential Links in the Paleoart-pocalypse. My post today is a deliberate follow-up to Witton et al's recent publication, in which the authors propose actions that invested parties can take to ensure that the paleoart the public sees in the news is original, creative, and accurate. From Witton et al. (2014). Earlier this month, Discovery News covered new research published in PLOS Biology which takes an embryological approach to resolving the relationship between modern birds and their ancestors, focusing on the development of the bones of the wrist. Certainly, a topic worthy of coverage. 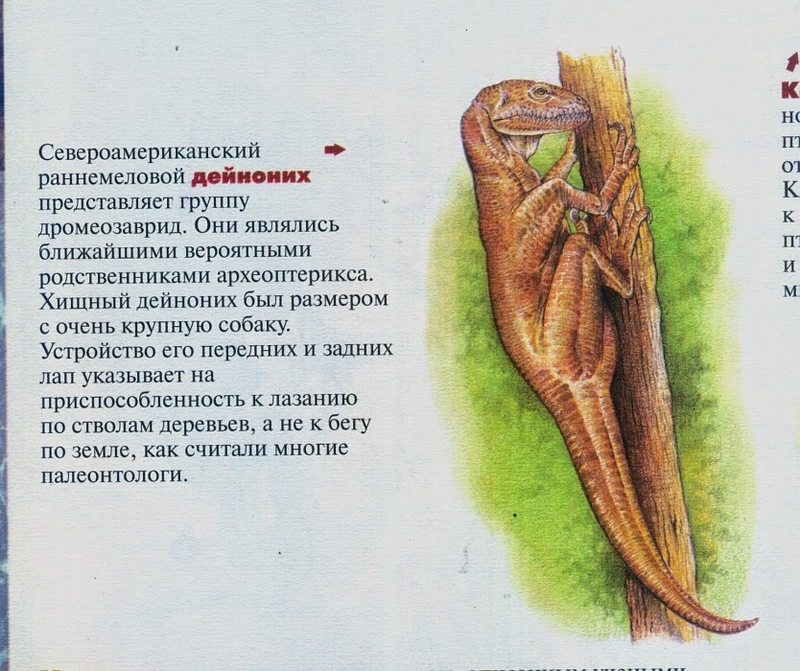 Unfortunately, they chose to illustrate the story with one of the most laughable restorations of Velociraptor I've ever seen. Here it is, reproduced with watermark from ThinkStock. Image from ThinkStock. Image number 481455933. Just soak in that for a few minutes. 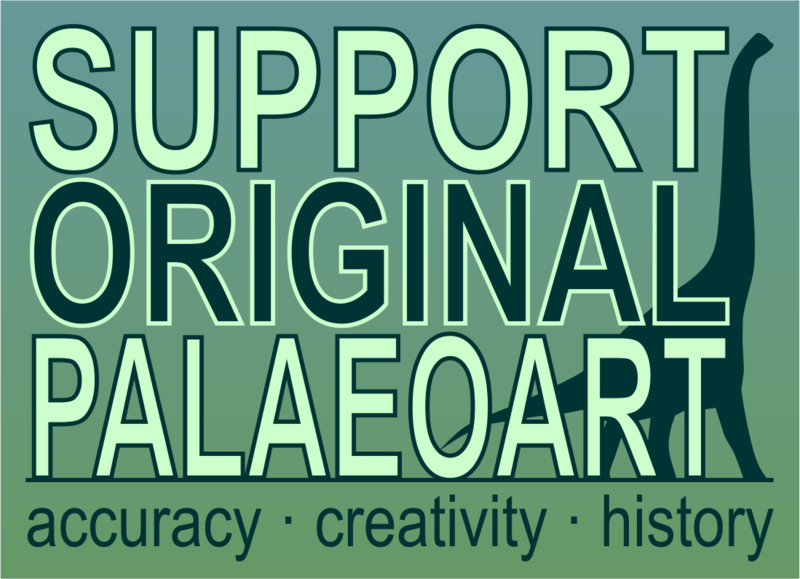 Without paleoart, there is no paleontology outreach. It must be held to a higher standard than illustration done for entertainment. Bad images are being marketed on stock image services, then used by journalistic publications to illustrate stories like the one linked above. Using a sloppy, lazy, otherwise ill-conceived restoration to illustrate a science article diminishes the whole enterprise. Readers will remember that bizarre Velociraptor with its hastily slapped-on plumage more than the details of the research. There is another, equally important effect of the use of these images: it takes money out of the wallets of conscientious artists whose work is passed over for garbage. A publication or website needs an image with an article (which says it all, really) but for some reason, decides the selection of the art doesn't require the amount of consideration as the article itself. The public loses. Responsible artists lose. After sharing the above artwork on Twitter, I decided it was imperative that I delve into stock image services to see what other abominations I might find. 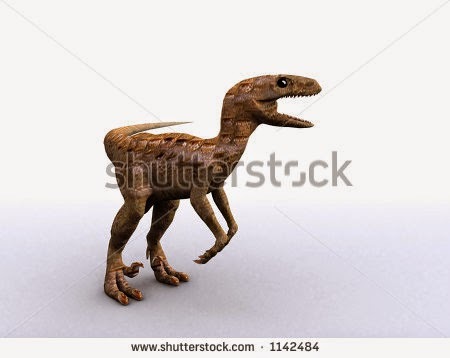 As I trawled the services, the undisputed champion and holder of the Crown of Derpitude was Velociraptor. Sure, other taxa were victims of shoddy renders, boring compositions, and unintentionally comic poses. 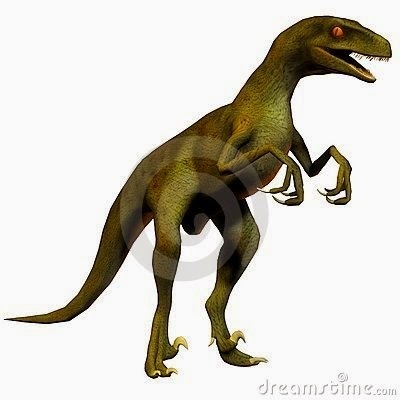 But Velociraptor was so badly botched, so often, that it demanded to be featured here overwhelmingly. 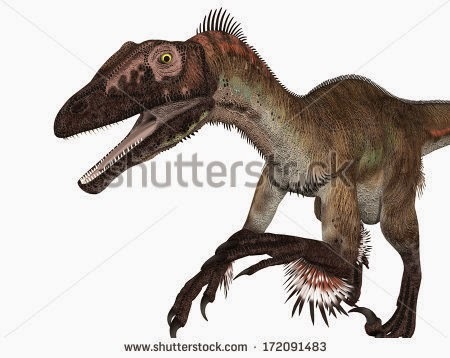 My best guess is that the offending illustrators had a hard time accepting the idea of feathers covering the Jurassic Park raptors in their heads, so they just tacked 'em on as whimsy dictated. Whatever the reason, these illustrators have knocked out an army of pitiable creatures ugly enough to make Chickensaurus look exquisitely bred by comparison. 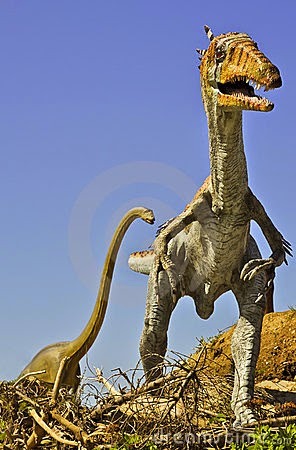 I hereby dub these misbegotten beasts "Velocicraptors." Since the Mesozoic roots of birds is one of dinosaur paleontology's great stories to tell right now, these wretches are capable of doing real damage to public understanding of just how that evolution occurred. So I'm not pulling any punches. The first two are fairly typical: botched feather attachment, bunny-hands, and in the second one, I'm not sure if the illustrator ever looked at the skull of the animal. You know, the way one might. If they wanted to make it look like the animal. Image from ThinkStock. Image number 183993135. Image from ShutterStock. Image number 172091483. Speaking of skulls: that's not an eye socket. Image from ShutterStock. Image number 1142484. 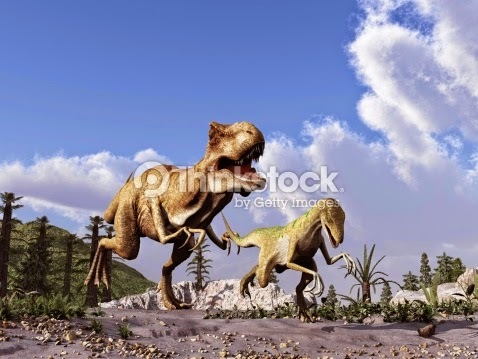 Here, naked and bunny-handed Velocicraptor is being chased by Tyrannosaurus. The pursuer actually outshines the quarry here, with bizarrely elongated fingers. Image from ThinkStock. Image number 507796691. 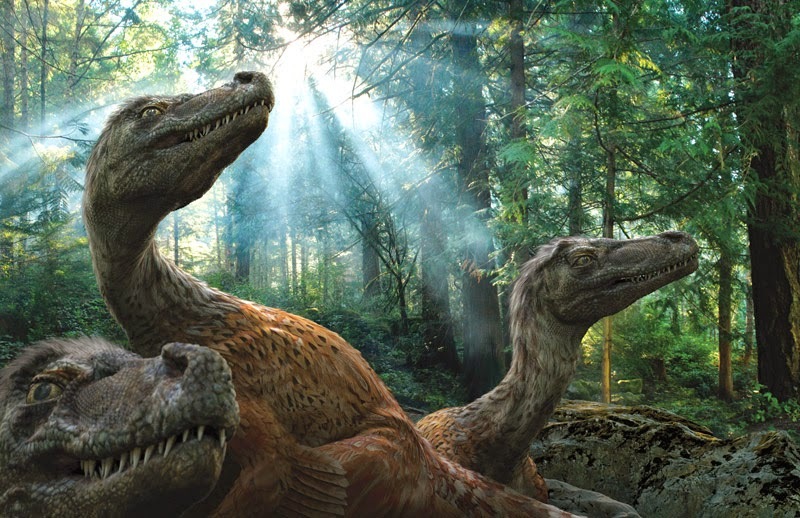 This scene is stunning: It's as if we've been transported to the Cretaceous and have happened upon a family of curiously glossy Velocicraptors. As the mewling craplings beg for sustaining milk (why not? ), mother cries out in agony, cursed as she is with woefully disjointed arms. Image fromShutterStock. Image number 172091483. My best guess: the Pilsbury Doughboy's defective clone is super-proud of his pet Velocicraptor, with its oddly undersized head, hands, and feet. Image from ShutterStock. Image number 56398084. Also in the "keep 'em scaly" camp is this super-reptilian fellow. Image from Dreamstime. Image number 8751082. Though Velocicraptors muscle out most of the competition, there are notable disasters for other taxa, too. 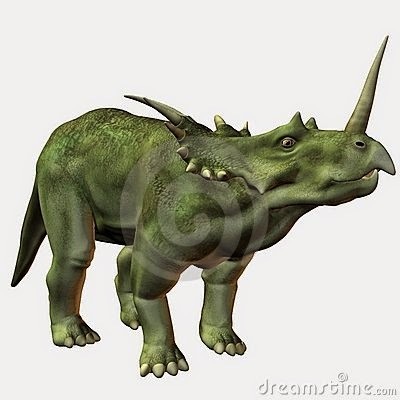 Here's a Styracosaurus, seeming to channel the spirit of the Crystal Palace saurians. Image from Dreamstime. Image number 783455. According to the image's page, this low-slung Ankylosaurus is a "Photorealistic 3 D rendering, scientifically correct... with full bone skeleton superimposed." No indication of what bones actually constitute real finds and which are speculative, no scale bar, but you know. Scientifically correct. Image from Dreamstime. Image number 31682514. Remember ol' mohawked "Syntarsus?" 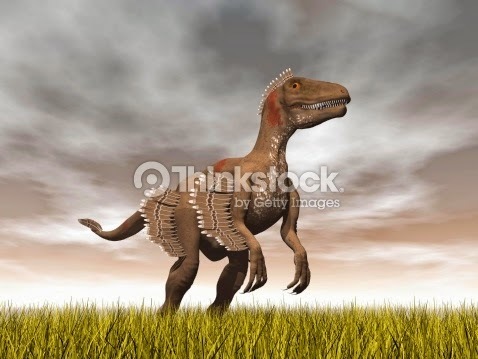 Although the image's tags lead me to suspect this is a photo taken at this dinosaur sculpture park, I'm including it because it could plausibly be chosen to illustrate a story, and it's real derpy. Image from Dreamstime. Image number 15948656. 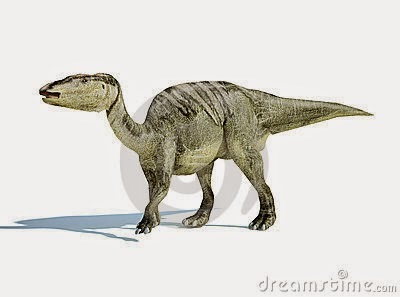 Something about this noodle-necked Edmontosaurus is really unsettling to me. Image from Dreamstime. Image number 22729752. This poor, shrink-wrapped Compsognathus. Can someone toss it a few Slim Jims? It may not help: I'm guessing it ate one of those mushrooms and is afflicted with some awful wasting disease. Image from Dreamstime. Image number 44911286. We'll close out here with one last Velocicraptor image, which is particularly heart-warming to me, as it reminds me of one of my favorite images in the Vintage Dinosaur Art series, the Iguanodon Conga Line. Needs a few more 'craptors, but it's almost there. Image from Shutterstock. Image number 55365946. If you think this is mean-spirited, that's fine. We've been accused of such things over the course of the Vintage Dinosaur Art series, occasionally warranted, usually not. 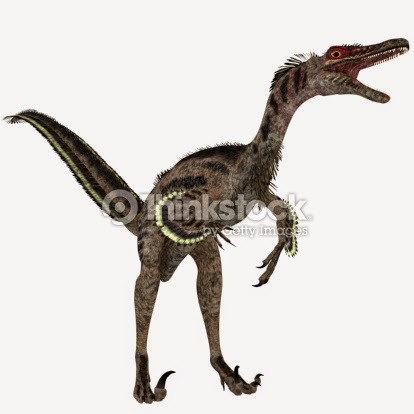 But my target today is people selling scientifically inaccurate scientific illustrations, which is plain wrong. I'm not dashing over to DeviantArt and insulting artists' work for kicks. 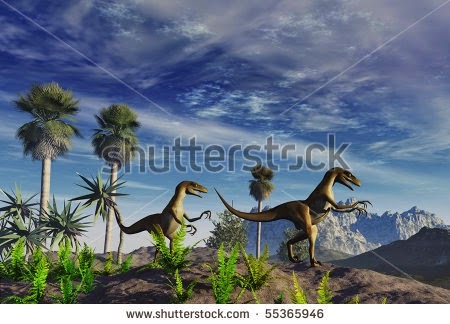 My advice to publications turning to stock image sites as sources for illustrations? Emily Willoughby, Alvaro Rozalen, and Chris Masnaghetti are on StockTrek. I have to admit that searching for stock images is by far my least favorite task in my work. So this was rough. I need a bubble bath and some pumpkin pie - maybe at the same time. So while I go do that, for crying out loud, support original paleoart. Use of images in this post constitutes Fair Use for purpose of critique. After a really super-long break, we're back with the 65th post in the Mesozoic Miscellany series. I really haven't meant to do these posts so sporadically, but I had some freelance jobs come up that took up a lot of time over the last few months. Sorry about that! I hope to get back on a more regular schedule with them. At Life Traces of the Georgia Coast, Tony Martin wrote a touching post in the wake of his mother's passing, reflecting on how he came from a childhood in poverty to pursue his passion for learning about nature. It's a must-read. A new site dedicated to Mesozoic paleontology has launched, called Dinologue, and is also active on Twitter. Dinologue also features the writing of Brian Switek, who also hosts short video features such as this one, in which Brian fields a question about whether Mesozoic dinosaurs lived in the mountains. Surely you've heard of the minor kerfuffle kicked off by the new Spinosaurus material revealed by Nizar Ibrahim and team? Ben Miller at Dinosours! gives us a look at the exhibition tied to the publication at the National Geographic Museum. Darren Naish, Mark Witton, and John Conway collaborated on an article for Palaeontologia Electronica, State of the Palaeoart, looking at the continuing difficulties of paleoartists wishing to be paid fairly in an atmosphere that rewards original, creative work. Beasts of Antiquity: Stem-Birds in the Solnhofen Limestone, the new book by Matt Martyniuk, has been released in Kindle, iBook, and print formats. As he wrote at DinoGoss, there are "other books written on Solnhofen, but this is intended to be more of a synthesis of current research and understanding of it and its stem-bird fauna accessible to a general audience." Best of all, it's the first in a Beasts of Antiquity series. The pneumaticity of bird skeletons and their evolution was covered by Liz Martin at Musings of a Clumsy Paleontologist. Over at Jersey Boys Hunt dinosaurs, Chris DiPiazza treats us to a peek inside Jamie Oliver's American-themed diner in London. Why? Because it's packed with dinosaur stuff. There's a nice assortment of derpy, clever, and just plain neato art and sculpture, so check it out. Maija Karala is back, and has been writing a series called Botany for Paleoartists at the Humming Dinosaurs blog (Parts 1 on ferns, 2 on fruits, and 3 on grasses). And if you didn't see it then, check out my interview with Maija published in July. LITC contributor Asher Elbein was published at Bitter Southerner, writing about the phenomenon of snake-handling churches in the southern US. It's a terrific piece. Congrats, Asher! Hard to pick just one, so here's a brief round-up within the round-up of cool stuff that's crossed my path recently. Shields and Spears is the title of the new art show from Raven Amos, Scott Elyard, and Zach Miller, opening at the Yak and Yeti Café in Anchorage today, October 3. I've been enjoying the works-in-progress shared on social media, including this great time-laps of Raven's great Leptoceratops piece. Read more at Coherent Lighthouse. Speaking of ceratopsians, Julius Csotonyi's "Ceratopsian Cornucopia" is available as a poster, a beautiful piece demonstrating the diversity of headgear among the ceratopsians. Angela Connor, known as Amaruuk at DeviantArt, Newgrounds, and Twitter, also has a great Redbubble shop. Paleo Portraits is a charming series of various extinct taxa, available in a variety of formats. 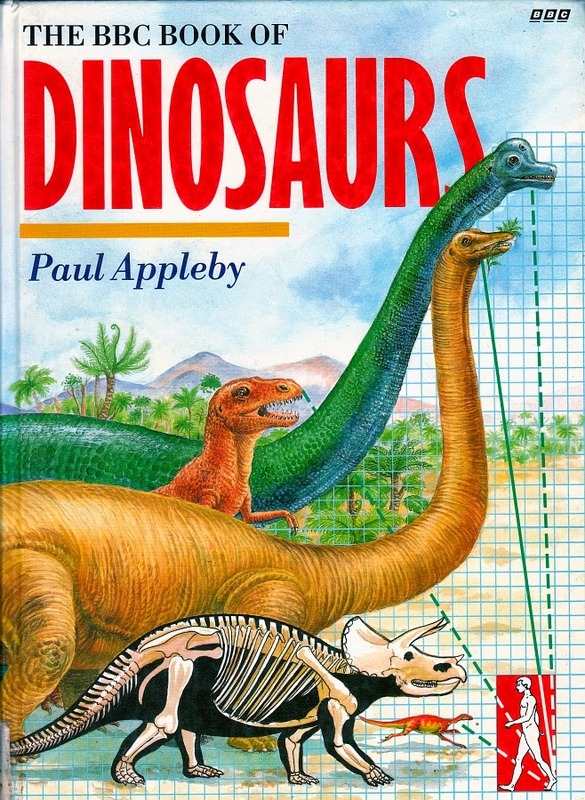 Our sole criterion for a book to qualify for the blog's Vintage Dinosaur Art series is that it is 20 years old. (And yes, because of that, I am very guilty of stretching the definition of 'vintage' to breaking point.) 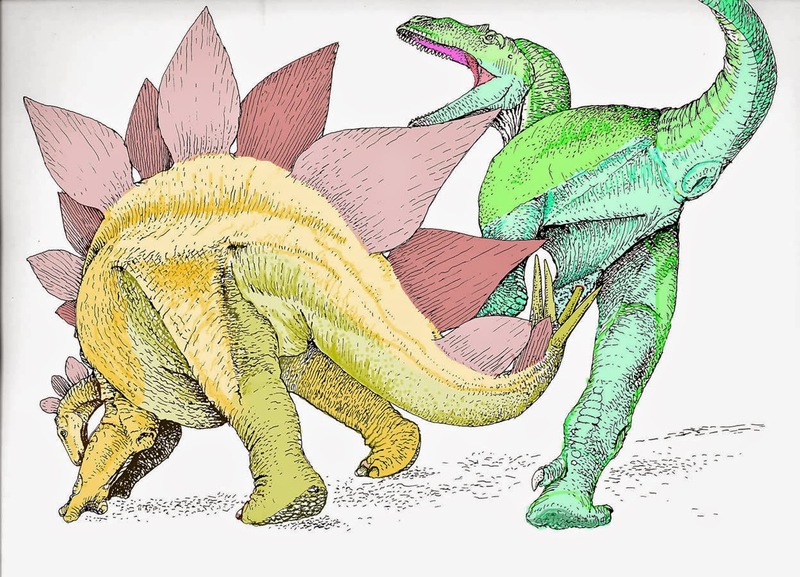 Atlas of Dinosaurs is rather newer than that, but as was plainly seen last week, it might as well be straight out of the 1980s. Following the panoramic illustrations in the previous post, I'd like to dedicate this one to depictions of individual animals. Warning: levels of plagiarism and the positions of eye sockets may vary.